Heating generally expands a substance. 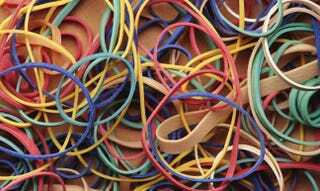 Yet if you heat up rubber bands, they shrink — and when they're stretched they get hotter. What's going on? Rubber has its structure to thank for its odd reaction to heat. Water and gas are materials in which compact molecules form tenuous bonds along fairly definite boundaries. Even in its solid form, ice, water becomes a crystalline structure that can break apart cleanly. When someone heats ice, the molecules of water start jiggling around faster and faster. Eventually, they move fast enough to break apart and form water, and then steam. Rubber is different. It's made from long, string-like molecules. Instead of being placed in an orderly crystal, like water, strings of rubber are tangled together. When rubber is heated, its molecules do the same thing water molecules do; they jiggle around. Anyone who has ever had to untangle Christmas lights knows that jiggling long segments of string doesn't make them break apart. If anything, they tangle together more tightly. The same thing happens to rubber molecules. They move randomly, faster and faster, and so they become more tightly snarled. They pull together and contract into little balls, and so the rubber contracts. Rubber and plastic heat when they're stretched. This is equally counterintuitive. When other materials are given more room, they cool. There's even a name for it; adiabatic cooling. To return to the example of water; a cylinder full of steam is very hot. If the cylinder is compressed, the gas will heat further. If the cylinder is expanded, the gas will automatically cool. When stretching rubber, though, you are not giving the molecules more room. They're tangled together closely enough that pulling on each end only forces the strands closer together. Since they are being squeezed into a tighter space, the molecules move faster, and so they're hotter. To test this, stretch a rubber band and press it to your forehead, lip, or wrist. The rubber will be hot. Let it contract again, and suddenly the rubber will feel cool. Via The Naked Scientists, Physlink, The Newton Answer Center.